Women – and men – from Boston were very active in the movement to gain the vote for women. Lucy Stone, Julia Ward Howe, Clara Barton and others gave speeches, wrote articles, and marched in parades during the almost seventy year struggle. Come and listen to present day Bostonians as they read from these writings and speeches that reveal women’s determination to be able to vote in order to participate fully in the political life of the country. Judith Kalaora, from History at Play, will be a part of the program. Ms. Kalaora portrays a number of famous women through living history performances, including Deborah Sampson, Christa McAuliffe, and Hedy Lamarr. We are very pleased to have her join us in the role of Lucy Stone, one of the most important figures in the woman suffrage movement. This event is free and open to the public. Light refreshments will be served. Co-sponsored by the Boston Women’s Heritage Trail and the Jamaica Plain Historical Society. 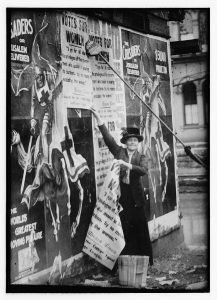 Image is of Susan Walker Fitzgerald, JP Suffragist and is courtesy of the Library of Congress.